Anyone who knows me knows I love SHOES! That’s my thing. So, small wonder I decided to create & hand make shoes to match our gowns or for anyone else who wants cute, cute shoes!!! The date of the christening can be embroidered on the bottom of the shoe, something I’ll be doing for our next customer. 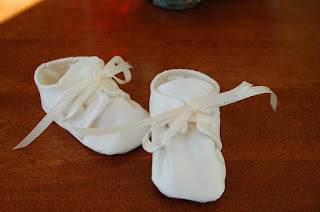 Boys need Christening shoes too! 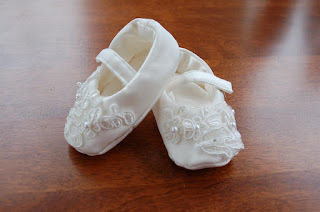 These little lace up shoes can be decorated with pearls from mom’s gown and can also have the christening date embroidered on the sole of the shoe. The ribbon laces can also be any color desired. 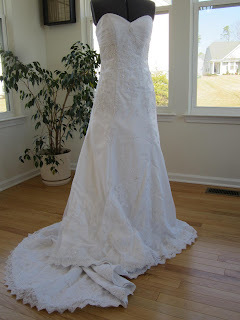 We have just taken on 2 more customers and are creating gowns for their babies….will try not to forget pics this time!